To support the Brain Injury Association and its BIAA-Texas Division, the UT Southwestern Peter O'Donnell Jr. 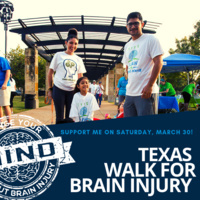 Brain Institute will be participating in the Dallas Walk for Brain Injury on Saturday, March 30 at Addison Circle Park. We would like to be able to count on you to support the Brain Injury Association to help raise awareness and the funds needed for programs and services that bring help, hope, and healing to our community. If you want to walk with us, follow the link below (there are options for a fee or a complimentary sign ups). If you want to support BIAA-Texas, giving is easy! Use password "Concussion" (with an uppercase "C").